Every autumn, the chickadee roams a territory covering tens of square miles, gathering seeds and storing them in hundreds of hiding places in trees and on the ground. Over the harsh winter that follows, the tireless songbird, which weighs about 12 grams and fits inside the typical human hand, faithfully re-visits its caches to feed. The chickadee's unerring spatial memory is remarkable enough, says Colin Saldanha, assistant professor of biological sciences at Lehigh University and an anatomist who has studied songbirds for six years. But it is what happens inside the tiny songbird's brain that Saldanha finds amazing. In the fall, as the chickadee is gathering and storing seeds, its hippocampus, the part of the brain responsible for spatial organization and memory in many vertebrates, expands in volume by approximately 30 percent by adding new nerve cells. In the spring, when its feats of memory are needed less, the chickadee's hippocampus shrinks back to its normal size. 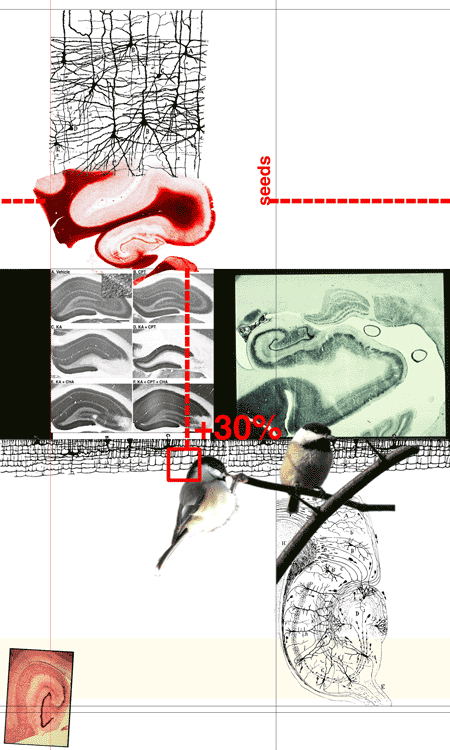 > chickadee hippocampus expansion composition. have you gathered your seeds?